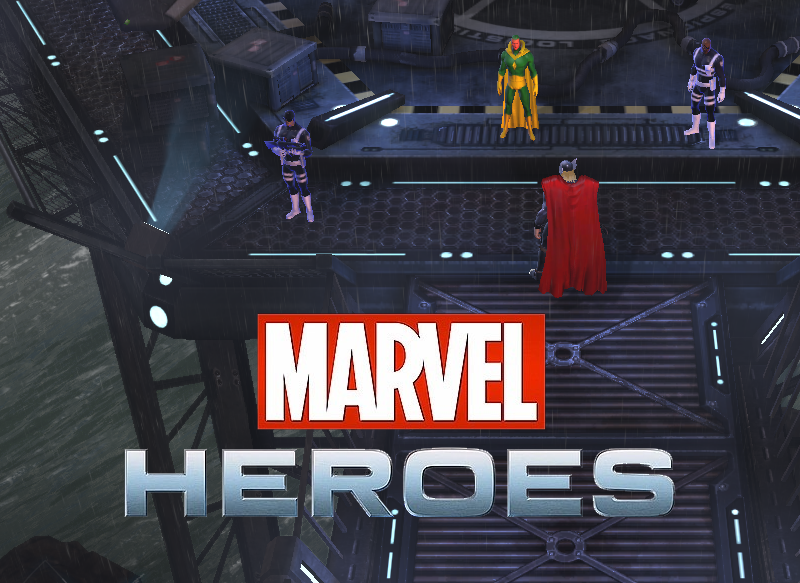 It might be exciting to play a game with all your favorite Marvel Superheroes, but for me Marvel Heroes doesn't bring enough new things to the table to make it more than a passing distraction. Admittedly, as I’ve stated before, I am not a big fan of superhero games. When I found out Marvel Heroes was having its final open beta, though, I decided to give it a try. I had no idea what to expect, having read nor heard anything on the game to that point. I just thought, “Hey, I like Marvel. I also like MMOs. Let see!” Sadly, other than flashy tights and cool powers flinging around, there wasn’t much to see. As I said, I had no idea what to expect, but I definitely was not expecting an isometric RPG style game. It probably shouldn’t have been a disappointment, but it was. I didn’t know it, but I guess I’m particular about camera angles in MMOs. I soldiered on. Initially, there is absolutely no character customization during character creation. You get a short list of existing franchise superheroes to choose from and off you go. I picked Thor (and later unlocked Scarlet Witch), and off I went. Having a bunch of players around me that all looked the same took me out of the game almost immediately. You can unlock new costumes, either through crafting (which I’ll get to shortly), or by buying them from the in-game real money store, but because these are all based on the Marvel franchises, you’re still going to always be surrounded by players who look the same or, worse, look exactly like you. I turned a blind eye to the hordes of Hulks and ran off to smack villains around. 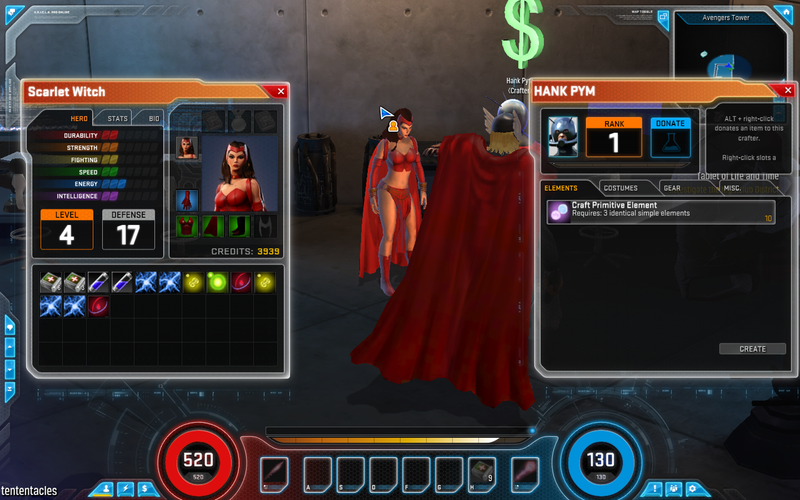 Combat in Marvel Heroes is fun. If you can get over the fact that there are two Iron Men, three Hulks, five Hawkeyes, and a Wolverine along side you, fighting in groups is even more fun. 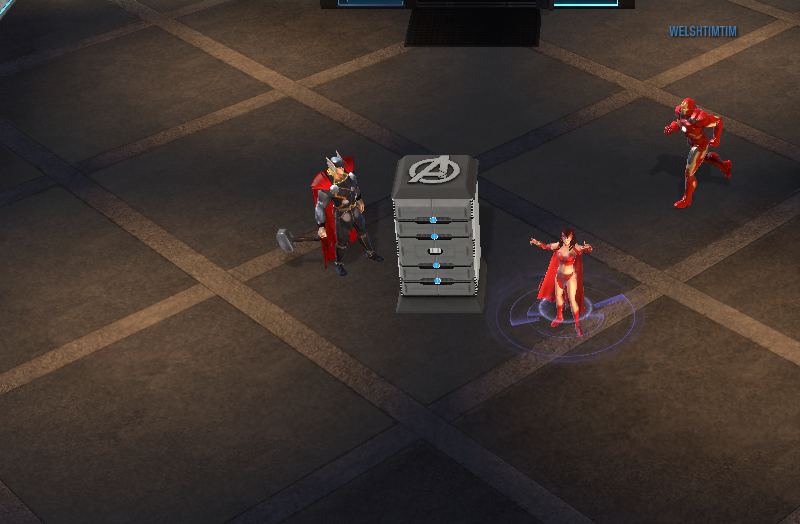 If you like combat in other isometric RPGs, like the Diablo and Torchlight series of games, you’ll like the combat in Marvel Heroes: click to kill, small action bar, main powers on the mouse buttons, auxiliary powers in easy reach. The skill trees give you more powers than you can use at a time, but this gives you some level of situational customization. No real complaints here as I do enjoy these types of games, but they aren’t MMOs so I’m usually running solo. Apart from the afore mentioned running around with tons of clones of yourself and others to make you feel like you’re in a massively multiplayer environment, Marvel Heroes also has a crafting system. I only played around it for a little while, but I can say it didn’t make me excited. The initial recipes are very limited, and the rate at which you advance both your level and the level of the crafter you use (that’s right, you don’t do the crafting … a crafting NPC does) is so slow as to be almost unobservable. The fact that this is one of the ways to get new costumes (that doesn’t cost real money) probably explains why. I dumped a good bunch of mats into this guy in the shot above, and the XP bar under his portrait only advanced by that small white dot. The notion of doing this sort of thing on multiple crafting NPCs (because there are more than just the one) made me want to cry. So what did I like about Marvel Heroes? Well, it is free to play, and the promise is that you’ll be able to play all the content for free, so that is very cool. Additionally, while you have to level each hero you unlock separately, they share just about everything else, i.e. bank space, crafter levels, etc. They also share a quest log, kind of. This is good and bad. While you don’t get the same quests dumped into your log on each hero, you also don’t get the reminder of quests you thought were fun and worth repeating. The quests, from what I can tell, are repeatable, but if you want to do them across your roster of heroes, best remember where they are. Over all, I did enjoy playing Marvel Heroes, but I don’t think it’s a game I’ll be spending a lot of time in. Like Diablo III and Torchlight II, it’ll be a game I keep installed and occasionally fire up when I’m in the mood to mindlessly click on things and run around picking up piles of coins and loot. If you want to see the game in action, check out the Marvel Heroes Gameplay Video I posted last week. Great review. I jumped in the fray over the weekend (thanks to your post). Started with Ironman, then with the free credits I purchased Deadpool and Hulk. Ended up sticking with the Hulk, he worked best with my style: bash and dash. I found that killing bosses was easy, with the exception of Bullseye (until I figured out that I had to hide behind something). It was my experience that the NPC level was the same between the various locations so if I leveled the crafting NPC in the Tower (Pym), the NPC performing the same service also is leveled at the Mansion (Forge). Depending on the rarity of the item and level, it gave more XP to progress the bar. But it did seem to crawl at times. I had fun. HULK SMASH! but I agree that it was repetitious and getting old quick.